This seems like an apt derivation and an appropriate name for this plant, whose colorful and attractive blooms are indeed a bright crimson shade that are as red as the life-giving liquid. And, if fact, we’re including crimson clover in our category of “Flowers” because of its colorful bloom that draws our attention as we drive down the highway and notice its eye-catching roadside brightness, as attractive as any passing wildflower. 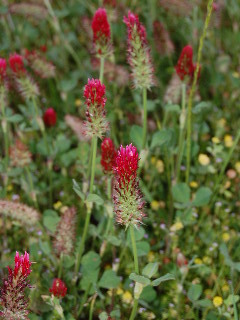 In all probability, however, the crimson clover we see along roadways and in the nearby pastures was planted not so much for us to enjoy the beauty of its blooms, but to provide food for livestock or for the benefit of the site on which it is planted (as in erosion prevention or as a cover crop that adds nitrogen to the soil). Crimson clover is undemanding of soil types and will do well on both sandy and clay soils of poor to medium fertility. It does need moderate levels of phosphorous that is either in or added to the soil, but it requires little nitrogen as clovers are herbaceous legumes that actually add nitrogen to the soil. Crimson clover is grown over most of the United States, much of Europe, and parts of Canada. Not only is it undemanding of soil types, it is also quite tolerant of both high and low temperature extremes. 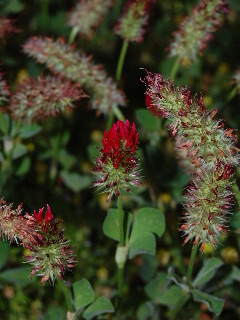 As a cover crop, crimson clover is often planted in the fall after the main crop of corn or grain has been harvested. In this way, it helps stabilize the cropland fields throughout the winter months in addition to adding nitrogen to the soil. If the crimson clover is planted in the spring, the stand can be used for grazing livestock or allowed to grow throughout the summer with the crop being cut and harvested as hay in the fall. Crimson clover is also a useful planting for stabilizing roadside areas that have been graded during highway construction. Its ability to grow in less than fertile situations makes it a good choice for such sites. One negative consideration is that the crimson clover may become invasive and may crowd out other and more desirable vegetation. The bright red blooms that give crimson clover its name are produced throughout the spring and summer months and make it a popular roadside attraction as we motor along the roadways of life and observe the incredible green and growing world around us.